Originally published in the WHO Goodwill Ambassador’s Newsletter for the Elimination of Leprosy, Issue No. 8 (June 2004). The information was correct and current at the time of publication. Leprosy broke up her marriage, but Yang Qian Mei was able to make a fresh start. 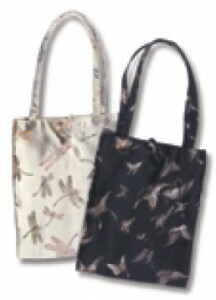 These cloth bags are among the products made by Handa Quilt. I was born into a peasant family in a mountainous area of northern Guangdong, China in 1958. I came from a happy home and married a man from a nearby village in 1980. We had three children, one son and two daughters. I managed the land and household while my husband worked as a truck driver. Eventually we bought a two-story home. Life was sweet. One day in 1991, my husband commented on changes in my face. When the doctor told me I had leprosy I couldn’t believe it. “I have never done bad things so why should God treat me like this?” I cried. I lost all confidence. I refused treatment because I knew it would affect my family. My face and legs began to develop ugly blisters. Finally, in 1994, I was forced to check into hospital. In two years, my husband only came to see me once. I excused him, thinking that he was busy working to support the family. The children had gone to live with their grandparents, but I later heard they had been sent back home by my brother-in-law because I had leprosy. I wanted to visit them, but my face was dark from drugs, and I was afraid. At age 10, my oldest daughter had to drop out of school to care for the younger children. I was in despair. After two years I was cured, but didn’t dare go back home because my face was still discolored. I worried constantly about my family. Then I had the chance to join a sewing class started by Handa* in Guangzhou and learn a skill. I worked very hard and was able to do well. The other women were much younger than me and I felt that I could comfort them and be strong for them. In July 1996, my husband came to see me. I was so happy, thinking he had come to take me back. To my shock, he asked for a divorce, and I discovered he was living with my niece. I felt as if I had been stabbed, and could not understand why hardship followed me around like this. If it wasn’t for leprosy, this wouldn’t have happened. Handa encouraged me through the hard times and gave me the opportunity to work. I became a teacher in the Handa Quilt project and now help to design new products. I am fast on the machine and don’t mind working overtime to make items for sale in bazaars and other outlets. People admire my work and I have regained my self-confidence. Recently I married a man who himself had leprosy. He is very attentive and loves me very much. He has accepted my children as his own. Life is sweet again. * Handa Rehabilitation & Welfare Association was founded in Guangzhou, China in 1996 to promote respect and dignity among all human beings, especially those who have personally faced the challenges of leprosy.